There is currently just the 1 ferry route running between Norway and Sweden operated by 2 ferry companies – Color Line & Fjord Line. The Sandefjord to Stromstad ferry crossing operates weekly with a scheduled sailing duration from about 2 hours 30 minutes. 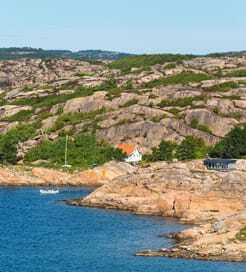 Whilst we’ve taken great care to ensure the information on this page is correct, as the frequency and duration of crossings on all routes can vary from time to time we’d advise that you get a live quote for current availability on this Norway Sweden crossing between Sandefjord and Stromstad. Norway is the westernmost of the three Scandinavian countries, encompassing the island of Jan Mayen and the Svalbard archipelago to the northwest. 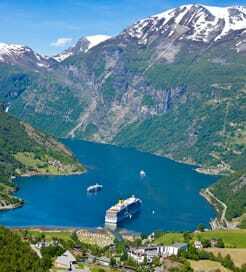 Best known for its deep and complex network of fjords along the west coast stretching from the North Sea into the Arctic Ocean, Norway is widely regarded as one of the most beautiful countries in the world. Mountains plunging into the sea, the midnight sun during summer and the darkness of winter with the northern lights unfolding above you are all just part of the amazing natural attractions. The capital, Oslo is a city of grand museums and art galleries to rival anywhere on the continent. As well as the innovative architecture, you’ll find upmarket restaurants and trendy cafes where you can relax after a long day of exploring Norway’s many landscapes. In Scandinavia, travelling by ferry is a popular mode of transport given the quantity of islands. Norway has a large number of ports on its southern coast, offering numerous routes to both international and domestic destinations.